Come in and taste today! Olive oil and vinegar selections make a taste sensation at any event. 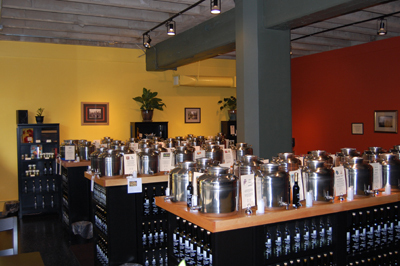 Benessere Olive Oils and Vinegars, Inc., is now at two convenient locations. We offer an extensive selection of products, all of which are presented in a ‘tasting room’ environment. 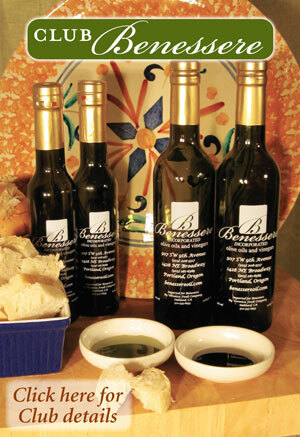 Benessere Olive Oils and Balsamics make wonderful gifts… come in and create a combination that best suits that ‘foodie’ in your life. And… if you live locally, bring back your bottles for a $1.00 credit on your next purchase. Benessere offers private tasting appointments for small groups. Call or come in to make your reservation today! Sign Up Today to receive Benessere's monthly updates! Email Marketing by VerticalResponse. Benessere takes your privacy seriously. Visit our two locations! Experience new flavors!